MH370: What do we know? What have we yet to find out? 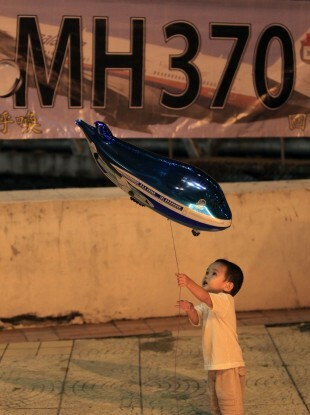 A boy plays with an aeroplane shaped foil balloon during a candlelight vigil for passengers aboard the missing Malaysia Airlines Flight MH370, in Kuala Lumpur. ONE MONTH AFTER flight MH370 vanished, there is still no proof of what happened to the plane or where it ended up, despite an intensive international search now focused on the Indian Ocean. But authorities believe they may be zeroing in, after ping signals possibly emanating from the plane’s “black box” of flight and cockpit voice data were detected deep down in the search area. Are the ‘pings’ from MH370? That remains to be determined, but Australia’s search chief said Monday one of the country’s naval ships had twice detected signals “consistent” with aircraft black boxes, the strongest indication yet that the hunt for the Malaysia Airlines Boeing 777 was on the right trail. The Ocean Shield is towing a US Navy deep-sea device designed to detect signals from “black boxes”, moving slowly back and forth across the ocean to try to pin down a location. Australian search coordinator Angus Houston said if further readings can be obtained, it could be possible “to establish whether the detections can be confirmed as being from MH370″. But the signal beacon on the black box has an average battery life of around 30 days, and could expire at any time now. And numerous undersea factors can distort such signals and their location. If they are from MH370, what happens next? If the pings are confirmed, authorities would deploy a submersible device to scan the seabed for debris. If found, the difficult task of reaching and recovering the black box in ocean depths ranging from 4,000-5,000 metres would begin. Seafloor-mapping and recovery is “a very intense and time-consuming process”, said Anthony Brickhouse, an assistant professor at Embry-Riddle Aeronautical University in the United States. But lessons were learnt during the two-year search for the data recorders from the 2009 crash of Air France flight 447, which contributed greatly to today’s body of knowledge, he said. “We know a lot more now that we did before Air France about how to do this,” he said. If the pings are not from MH370, might the plane never be found? If the pings are confirmed not to be from MH370, the search is back to square one, raising the daunting spectre of an open-ended surface search for floating debris or painstaking seafloor-mapping. But Air France showed that success is still possible. Its black boxes were not located before their signals expired, necessitating a two-year search using submersible drones and other means to locate a debris field. A Remotely Operated Vehicle which can recover items in extreme depths was eventually sent down to pluck the recorders from the seabed. But authorities had a better idea where the Air France crash occurred. Houston warned that in any scenario, “the recovery operation will take a long, long time” for MH370. Was the plane commandeered by hijackers or terrorists? This theory gained early attention due to the revelation that two Iranian passengers boarded using stolen passports, and after Malaysian authorities said the plane appeared to have been deliberately diverted. But Interpol said the Iranians were apparently just illegal immigrants heading to Europe, and Malaysian police last week said investigations had “cleared” all of the plane’s 227 passengers. “I think the possibility of this theory is pretty low,” said Terence Fan, an aviation expert at Singapore Management University. Did one or both of the pilots go ‘rogue’? Malaysian authorities have said a knowledgeable flyer likely diverted the plane and that its communications systems appear to have been shut off around the time MH370 went missing, suggesting deliberate action in the cockpit. All of this has led to intense scrutiny of Captain Zaharie Ahmad Shah, 53, and First Officer Fariq Abdul Hamid, 27, but no evidence has yet emerged to suggest either held extremist views, had pyschological problems or any other motive. Zaharie, a 33-year veteran of Malaysia Airlines, was a respected senior pilot and evaluator of younger aviators. Questions were raised about Fariq when a young South African women said she and a friend were invited into the cockpit of a 2011 flight that he served on – in breach of cockpit security rules. But those who know Fariq have attested to his good character. He was engaged to be married, according to reports, and was considered a promising pilot. Did MH370 become a ‘ghost plane’? This idea gained traction after Malaysia announced on 15 March – a week after MH370′s disappearance – that the plane apparently flew for nearly seven hours after vanishing from radar. “Ghost planes” – in which the crew is incapacitated, leaving the plane to fly on aimlessly – have occurred before. In 2005, a Greek Helios Airways plane with 121 aboard flew for hours after a sudden lack of oxygen incapacitated the cockpit crew. It crashed, killing all aboard. Some believe MH370′s pilots diverted the plane due to such an event – possibly attempting to return to Kuala Lumpur airport – but were subsequently incapacitated, leaving the plane to fly on autopilot. The shutting off of communications systems may have been an attempt to stem a fire cause by faulty electrical circuits. The stretch of ocean where the plane is believed crashed is also about the distance it would have travelled before running out of fuel, the airline has said. Do we know everything the authorities know? The Malaysian government has continually refused to release full details of the sequence of events around the time MH370 went missing, and what little that has been released has frequently been contradictory. This has helped sustain conspiracy theorists who allege that the truth is being hidden or manipulated by Malaysia’s authoritarian government – which has a history of covering-up embarrassing scandals and coddling the flag-carrier Malaysia Airlines. Malaysia has said it is hiding nothing, but “there are things here and there that suggest they know a bit more than they are telling”, said Fan. What aviation changes might arise from MH370? The aviation industry has a history of learning from disasters and implementing safeguards, making air travel one of the world’s safest modes of transport. However, unless MH370′s black box or some wreckage can be recovered, that learning process cannot begin. But MH370 has already sparked new discussion of implementing real-time satellite tracking of airliners to stop them going missing, and possibly reassessing the pilot’s ability to turn off communications systems. “Having an improved way of tracking aircraft and always knowing where every aircraft is at any given time” is “clearly now a high priority,” International Air Transport Association chief Tony Tyler said last week. Email “MH370: What do we know? What have we yet to find out?”. Feedback on “MH370: What do we know? What have we yet to find out?”.